The Center for family support of Ordzhonikidze social service is located in “Vostochny” micro district of Mariupol. It is the district which was cruelly shelled on January 24, 2015. At that time 29 people perished and dozens were wounded. Locals are not in a hurry to restore the damaged houses. Some of them are expecting more shelling: several windows in each house are scotched for them to stand the blast wave. 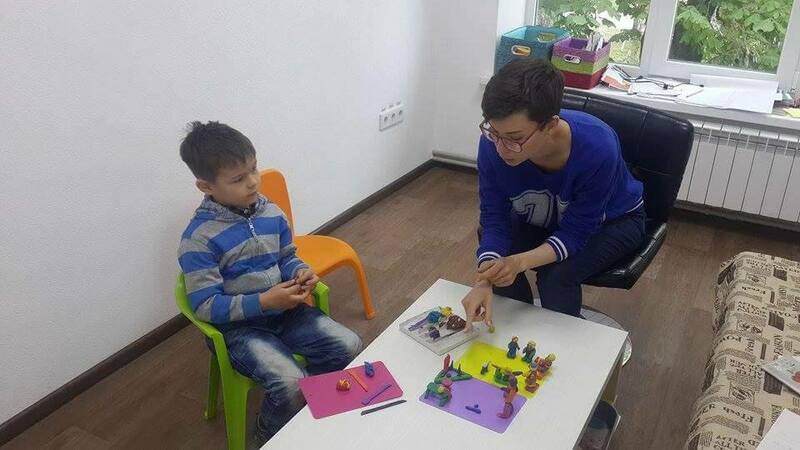 The children therapy course lasts, on the average, for 2-3 months and it is conducted in close cooperation with parents and often with the whole family. This May, the course for preparing children for school was launched in the Center as parents cannot afford private teachers. The classes are held on Saturdays. - We have 2 groups, with 10 kids in each. The class for the first group starts at 3 pm and lasts till 4 pm. The first 5 minutes is the organizational time, then 40 minutes of the class, and 15 minutes of the so-called “feedback” when parents come into the classroom and we explain to them what we did, what we tried to learn, what we have learnt, the home task as, if kids do not refresh the material during the period of 8 hours, they will forget it. After this 15-minute “feedback” the second group comes, says Nadiya Mykhaylivna, the teacher. Nadiya Mykhaylivna is a local, from Maryupol. She has been working at a primary school for 25 years. As well as all the other workers of the Center, she went though a pre-selection process. - I was interviewed and I was hired till the end of this project, says she. The majority of the Center workers are part-time workers. The project will be over in September, 2016. There will be another group of children after this one, but it is not known so far what will happen after that. The center is attended mainly by IDPs' children, but children from Mariupol families too if they have happened to be in a difficult situation. - They are children from micro district “Vostochny”, explains Nadiya Mykhailivna. It is difficult for them to arrange private classes for their kids. There is a speech expert working for the Center too. It is Olha, who has ten-year working experience. Her main job is in kindergarten #49. She got information about the Center from a friend who works for the social service center. She gave the center administration Olha's telephone number. Olha was called and invited to work. Today is her first working day at the Center. Olha works for the kindergarten on weekdays, then she will also work for two more UNICEF rehabilitation centers on Saturdays as Olha is the only speech therapist there. - I examine the kids and give them big homework as I will work here only on Saturdays. My job is to identify what sounds the kid pronounces, and what sounds does not; what the problem is: whether it is phonetics – the kid cannot pronounce some sounds, or it is a speech problem, a phonemic one. Maybe, the problem is with vocabulary: the kid does not know words or cannot put them together in a sentence, or just cannot differentiate sounds, Olha explains. It is also necessary to identify those who really need classes, and those who just think that they have a problem and need classes. During the first 2 hours of the working day in the center, Olha examined 11 kids. There are 20 more, waiting. All of them have different problems and need individual approach. As a rule children aged 4-6 come to consult a speech therapist, but older children sometimes come too.